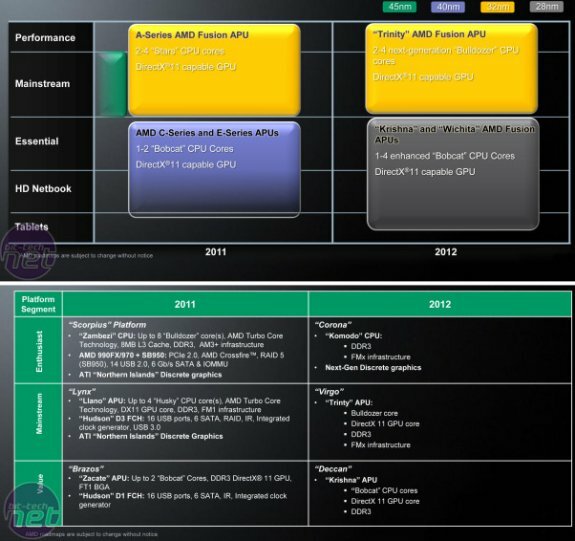 Bit Tech got its hands on details about AMD's 2012 processor roadmap. After months of secrecy, AMD has finally revealed some of its plans for the CPU market in a recent briefing, and there are some curious highlights. For example, next year will see the first ever 28nm AMD processor, meaning that AMD and its fabrication partner GlobalFoundries are keeping pace with Intel fairly well. While Intel is talking about 3D Tri-gate technology for its Ivy Bridge range of CPUs, AMD's new chips will still be fundamentally based on 28nm transistors..